If you are working on the Microsoft LightSwitch sample, and you have SQL Express 2005 or you do not have a SQL Express instance at all, you will face a couple of problems running the sample. The database cannot be opened because it is version 655. This server supports version 612 and earlier. A downgrade path is not supported. To address this, you will need to upgrade that instance to SQL Express 2008. The latest at the time of this blog is the R2 version. Make sure to keep the SQLExpress instance name, otherwise you will face the next problem. To address this error, you should edit the project file which has the extension lsproj and look for the property SqlExpressInstanceName. You should replace the SQLExpress instance name for the instance name from your environment. Once you have made those changes, the sample application should run without a problem. If you try to load the url http://www.mysite.com/myservice.svc IIS resolves the address, but the WCF setting is in conflict, and an error is shown. Using the web.config, we can add a setting to filter the IIS base address that does not mapped to the WCF based address (add the setting in the system.serviceModel node). This should eliminate the conflict, and the request should go to base address defined by the web.config. In addition, a common mistake is that the baseAddressPrefixFilters may be set to the same base address of the WCF service. This filters out the base address and causes the “Could not find base address error”. Following our previous scenario, if you add the setting below, the error will be recreated. This allows us to track supporting tasks done in either the staging or production environment. This depends on the template you are using on TFS. You may create another entry that reads Support. The work still remaining. This is important to update because a tasks may not be completed the same day, but you need to report the number of hours left. It is important to add the completed work and remaining work to the correct Area and iteration path. This would be the only way that the reports can accurately show how much support effort is being done and in what iteration. This can lead to a better understanding of the development process and identify possible issues. At least one security token in the message could not be validated. This error does not tell us much about the problem, but we know there is a security problem. A way to troubleshoot this is to first enable logging on the web service. We enable the logging of the messages at the transport level by adding the following diagnostics settings in your web.config file inside the system.serviceModel node. You can now deploy the web.config changes in your test environment and send a couple of request. If you do this on production, make sure to remove the settings after recreating the problem. Once you have recreated the problem, look for the log file (see initializeData attribute) and open it with trace viewer. We are looking for items highlighted in red under the Activity tab (left pane). 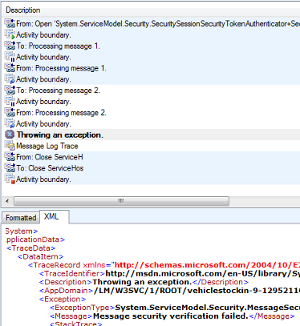 Select one of those messages and on the right-top pane look for a message that reads "Throwing an exception". Select that message and inspect the details under the XML tab(see image below). There, we can find a detail stack dump of what is really causing the problem. You can look carefully for the class name in your project, and you would probably be able to identify exactly what may have gone wrong. InvalidOperationException: IIS specified authentication schemes 'IntegratedWindowsAuthentication, Anonymous', but the binding only supports specification of exactly one authentication scheme. You are probably using an activation host factory that does not agree with the IIS settings. The error means that the IIS application configuration has been set to support multiple authentication schemes, but when the service is trying to get activated it does not know which authentication scheme to use (ambiguous). There is a good chance that your development environment is configured differently which may explain why the error was not generated during your unit test. We should now match those settings in the development environment and try to recreate the error. Once the error is recreated in the development environment, we need to identify why our service does not support the multiple authentication schemes. Open the SVC file and look for the Factory property. This factory property makes it easy to auto configure our services when there are no configuration settings in the web.config. This error is commonly created when the host factory is set to use WebScriptServiceHostFactory which adds an ASP.Net AJAX end point to the service. This dynamic endpoint is the one being used for the web service, and it is causing your application to generate the error. To address this problem, change the factory to use the ServiceHostFactory which supports multiple authentication schemes or just remove the factory attribute all together. By removing the factory attribute, the service uses the information from the web.config. We first declare an integer array with the values we are looking for. We then use the Contains method to compare the values. If you add a SQL trace, you will be able to see how this LINQ statement is translated into a SQL statement that uses the IN operator. *Note: dbcontext is the data context class that is created when a dbml file is added to the project. This is what generates the LINQ classes that are used for the database access.